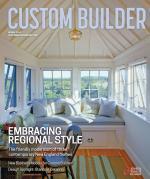 Sublime Homes, St. John, Ind. 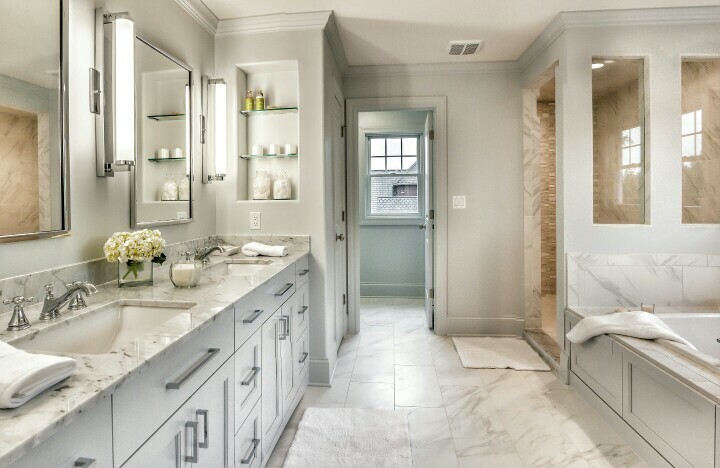 The soft hues of silver throughout this bathroom create an indulgent, serene ambience. 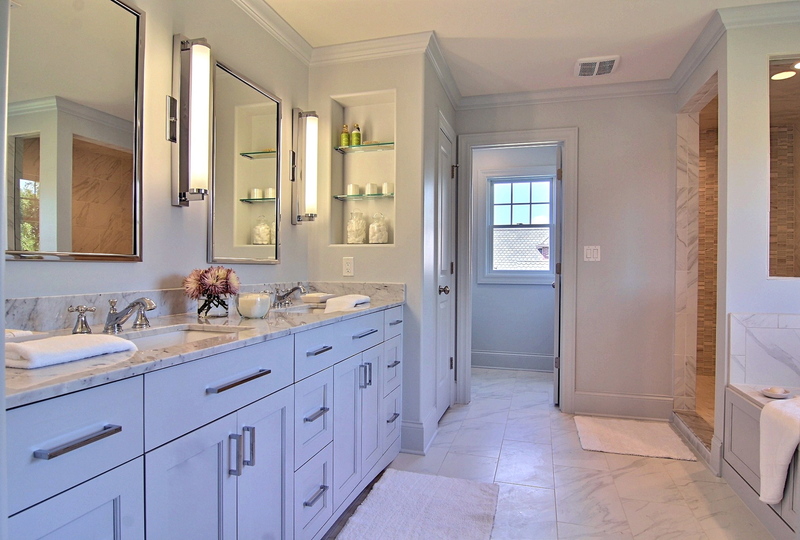 Recessed niches finished with custom glass shelves and chrome brackets take advantage of wall space, creating his-and-hers storage next to the sink. 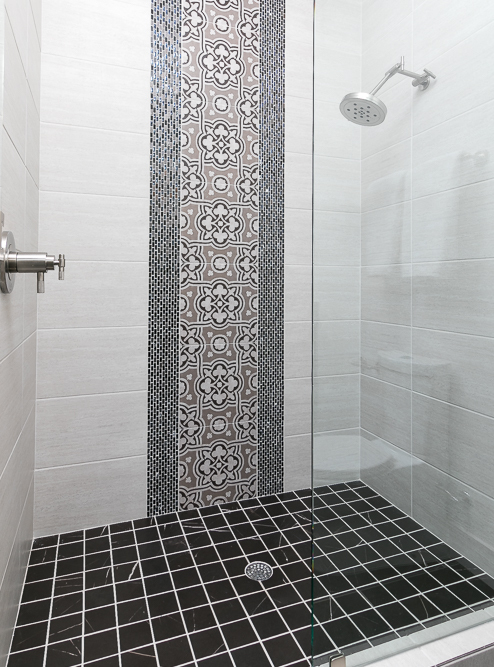 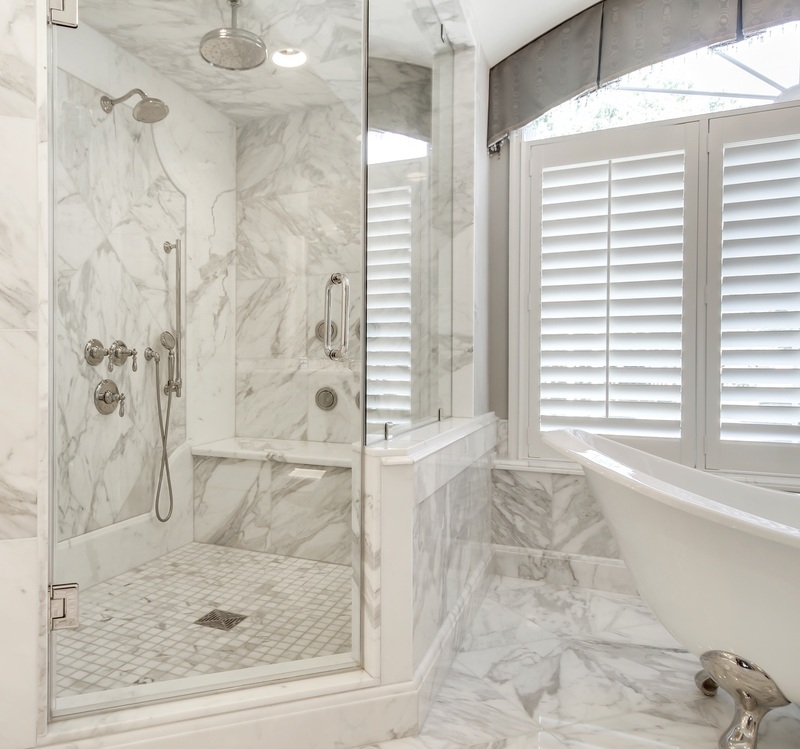 More and more clients are forgoing a tub and investing in a one-of-a-kind shower. 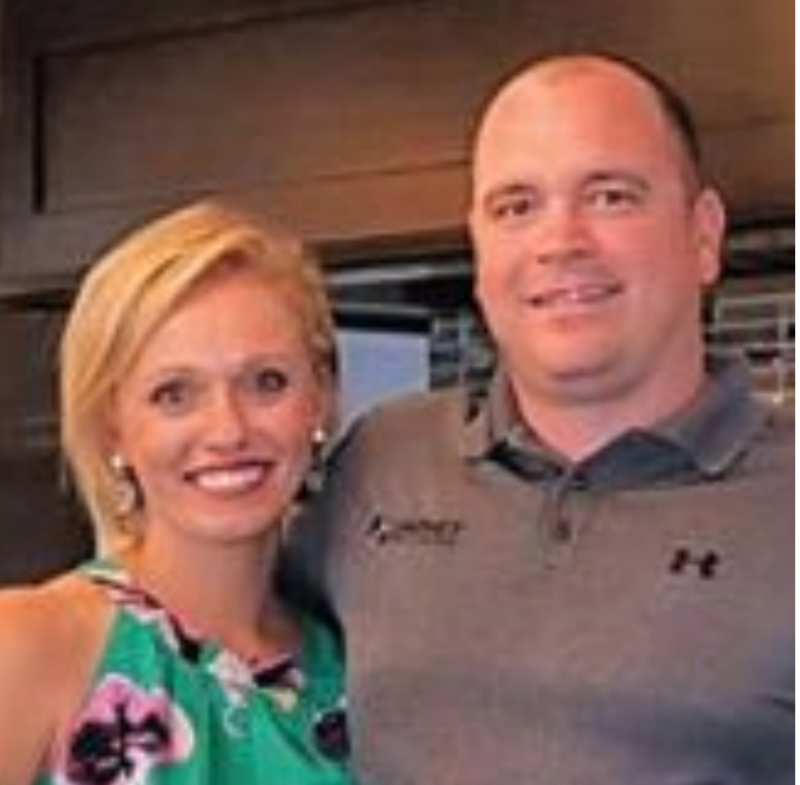 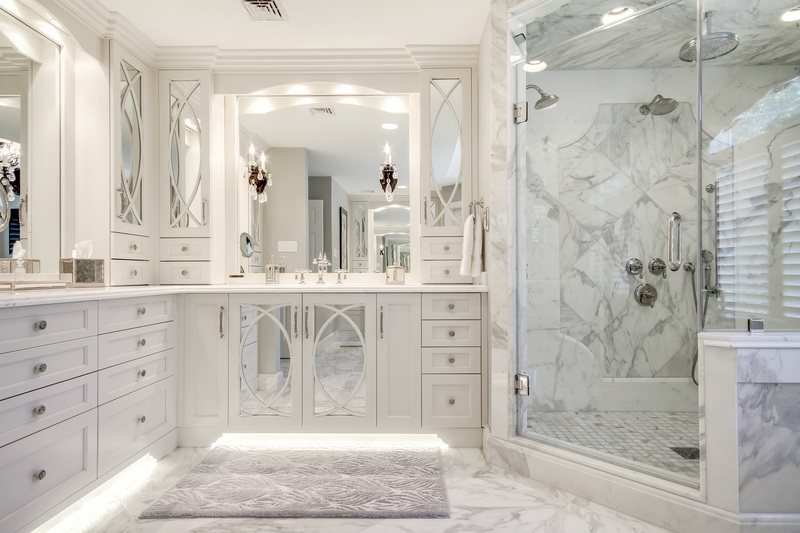 His-and-hers configurations are on trend. 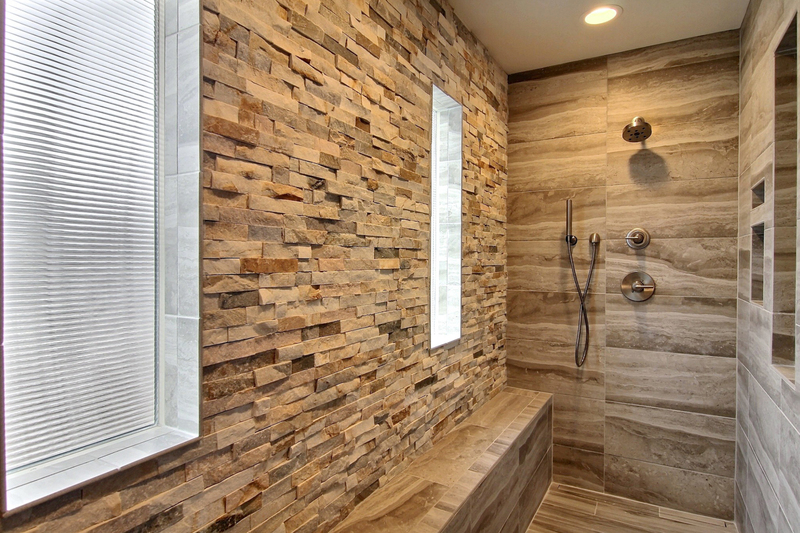 Specific requests include floor-to-ceiling stone, abundant natural light, curbless showers, and hand sprays and body jets. 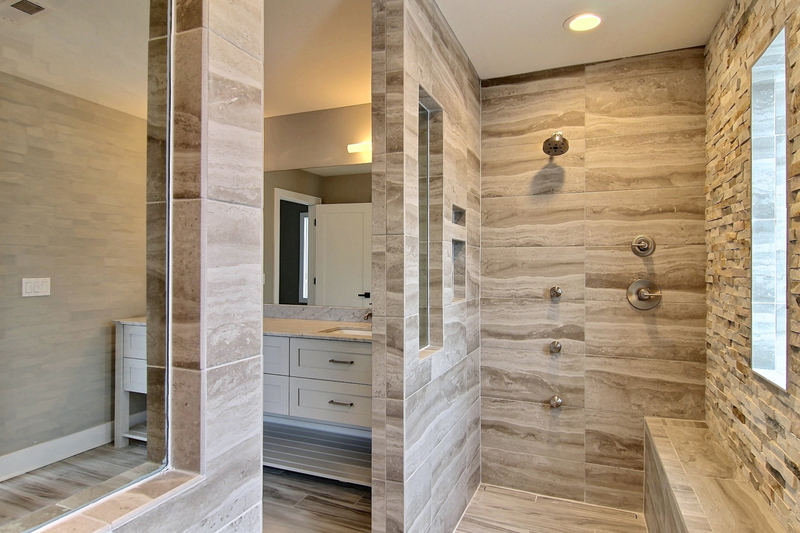 Here is another home with a his-and-hers shower configuration. 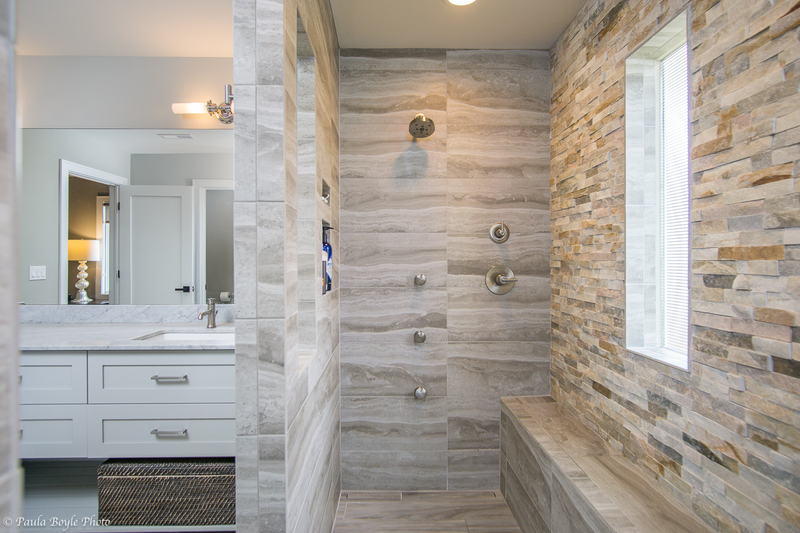 Natural stone is an integral part of this project. 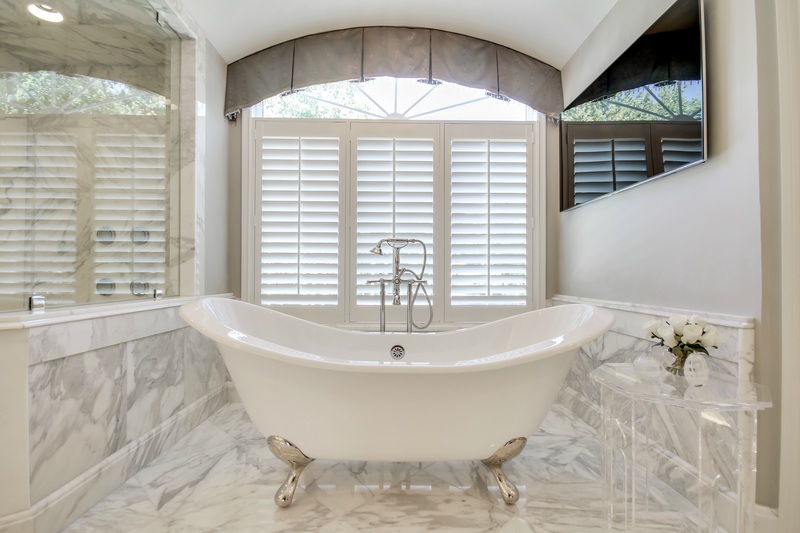 Slab-paneled walls of Calacatta marble—similar to Carrara, but with more dramatic veining—are set off by wide marble molding. 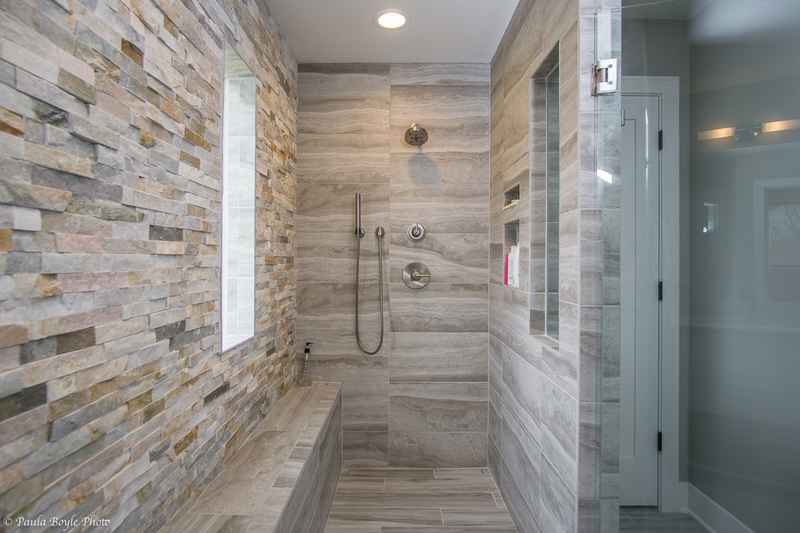 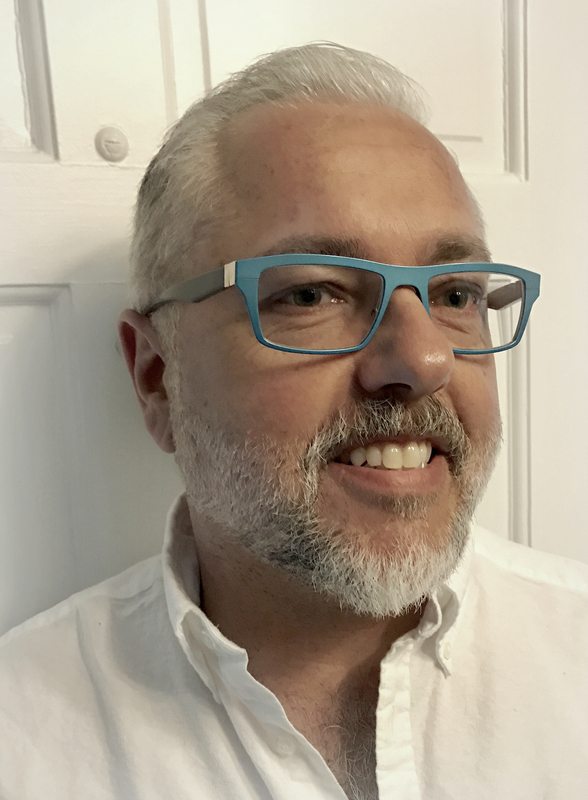 The commodious shower has a fixed showerhead, as well as a rain showerhead and a handheld, with a marble bench in front of the body-spray jets, enabling a relaxing seated hydro-massage. 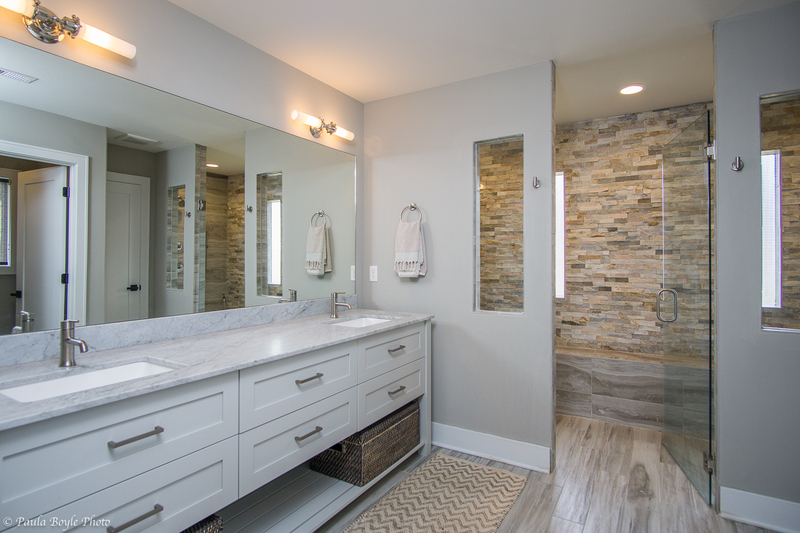 Twin vanities with rock-crystal sconces and toe-kick illumination create a functional and beautiful space, while abundant storage ensures everything has a place (Photos: Joseph G. Alfano, Courtesy of Stoneshop). 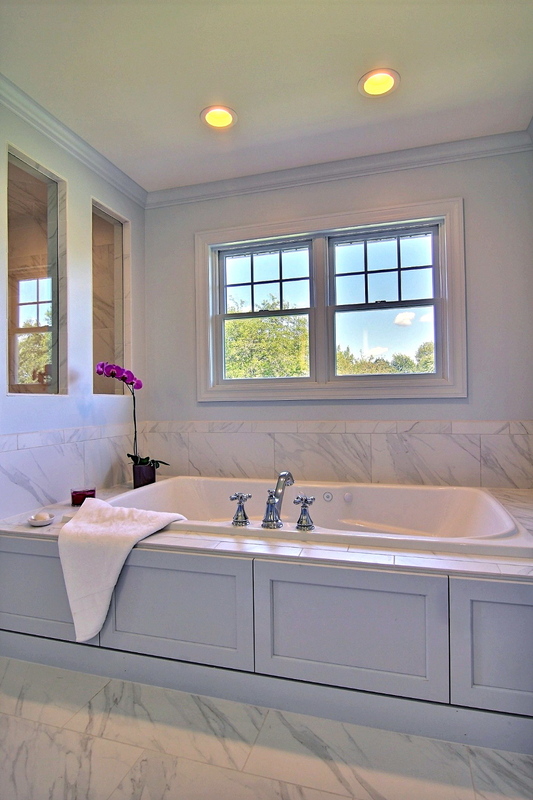 The elegant soaking tub sits in a marble alcove below a picture window. 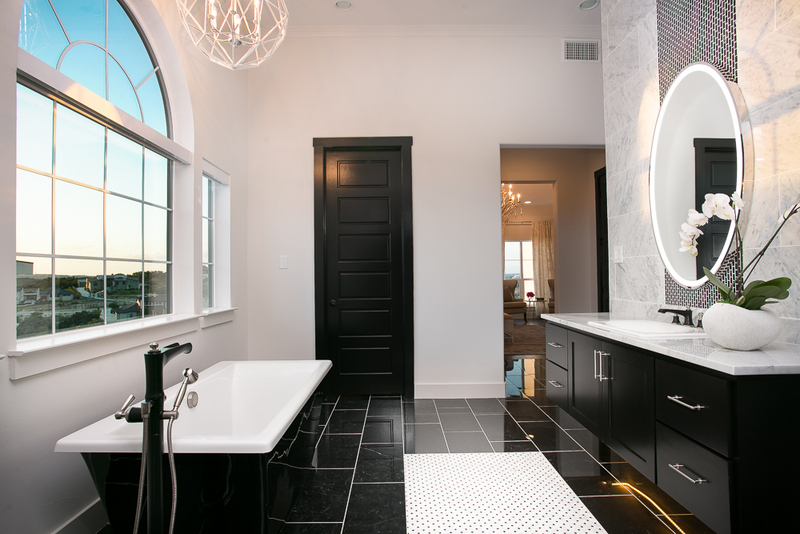 Our bathroom design for the 2017 Parade of Homes offers timeless elegance with modern details, such as LED-lighted mirrors and electric shades, creating a his-and-hers space with both masculine and feminine touches (Photos: Rick Garza, Bright and Early Productions). 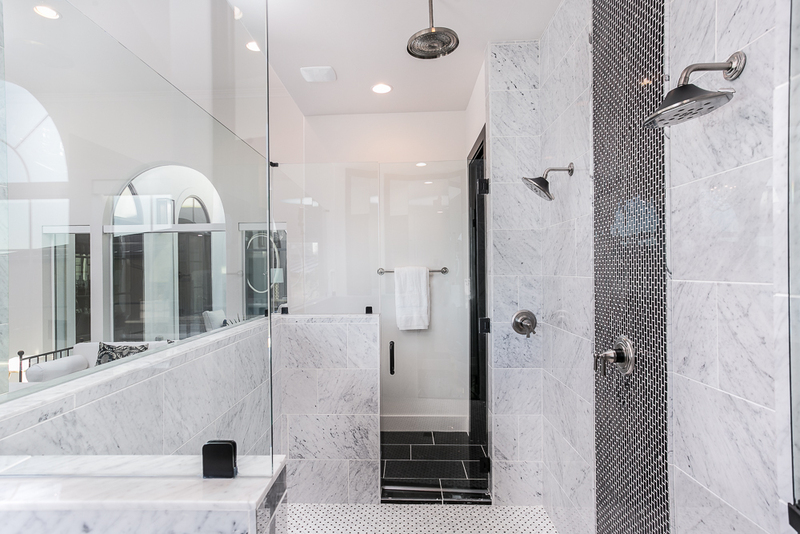 We specified Empress black marble for the floor and a black-base freestanding tub, and white Carrara marble for the shower wall and behind the vanity mirrors. 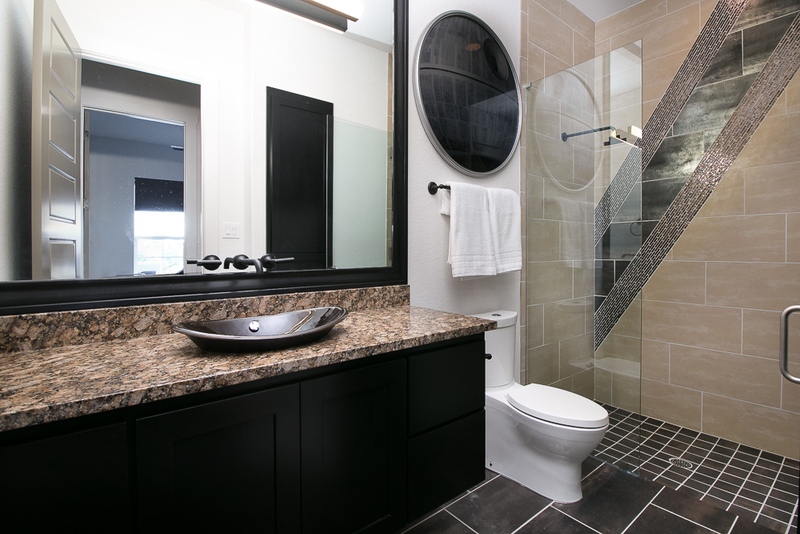 With its clean, classic black-and-white palette, this bathroom will be sure to stand the test of time. 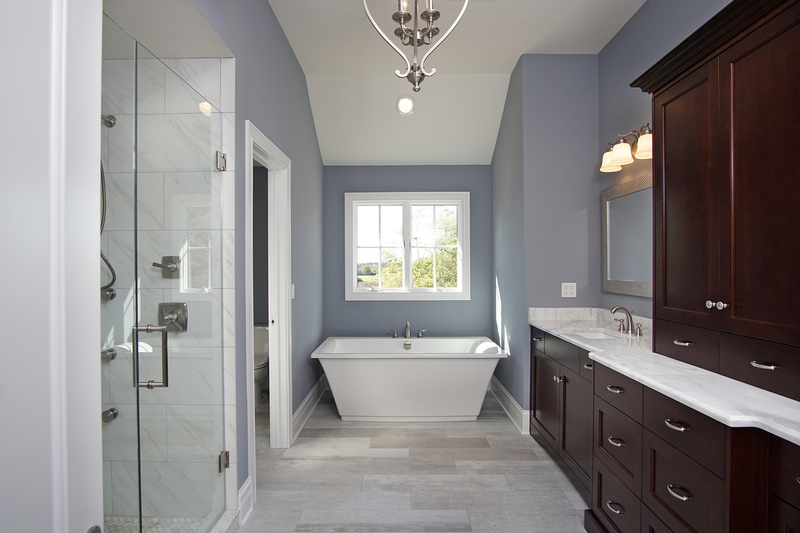 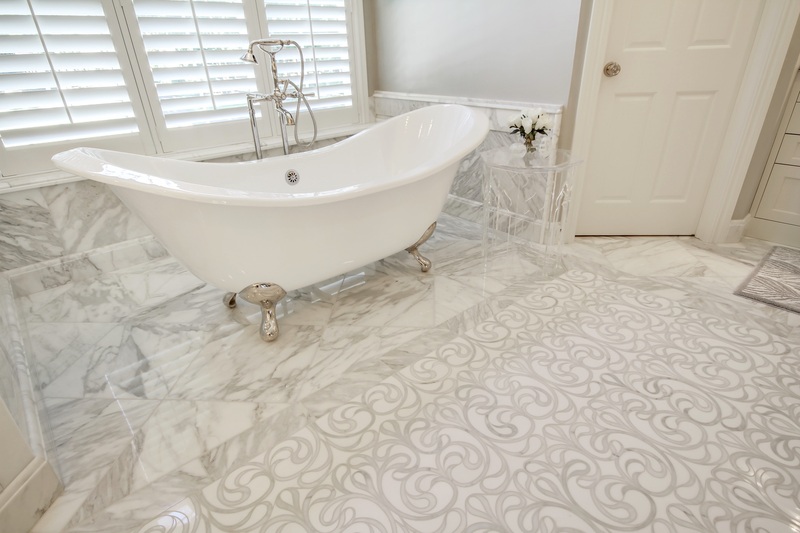 Comments on: "Design Spotlight: Spa-Style Baths"